Project obstacles and solutions: As part of the Ohio River Bridges project, the new Abraham Lincoln Bridge was constructed to route northbound traffic on I-65 across the Ohio River from Louisville, Kentucky to Jeffersonville, Indiana. The Lincoln Bridge was erected next to the Kennedy Bridge (I-65 southbound) as part of the Downtown Crossing portion of the Ohio River Bridges Project. Walsh was the general contractor for this project and built the barrier walls. Milestone did all of the structural concrete work. From the Indiana side of the river, there are three auto-traffic bridges that begin spanning the river in less than a half mile of space - the US 31,Clark-2nd Street Bridge; the I-65 South, Kennedy Bridge; and the new I-65 North, Lincoln Bridge. With major renovations happening, the new entry and exit ramps on the Lincoln Bridge were critical to relieving congestion on the Indiana side of the river, especially as the Lincoln Bridge opened and construction began on the Kennedy Bridge. The concrete for the new entryways had to be poured in all kinds of weather and varying temperatures. It also was delivered from every conceivable angle, especially for the bridge decks. IMI QC/QA kept a close eye on three factors: air entrainment, strength and surface evaporation. Air entrainment is impacted every time the concrete is moved in its plastic state. Concrete that is pumped to a job site is bound to lose some of its air from the truck to the spot of final placement. IMI QC/QA worked with plant operations to make sure the air was within its specified range when it was placed. The concrete used for the bridge decks was a Class C concrete. It was specified as a 4,000 psi 28 day mix. IMI was consistently exceeding this in 72 hours, which allowed Milestone to load the deck and continue to work. This sped up the construction schedule. There were also some special requirements for a post-tensioned bridge requiring a 5,000 psi in 24 hours. In that case, IMI QC/QA used a modified Class C concrete that utilized a high range water reducer to lower the water-to-cement ratio and provide a higher overall strength for this section. The other natural problem that can occur on flatwork that is elevated along a river is windy conditions. This can cause plastic shrinkage and surface cracking. This occurs when the surface of a slab dries out quicker than the rest of the slab. The wind was blowing most of the time on this particular job. IMI monitored surface drying and supplied evaporation retardants, when needed, to slow the escaping moisture. Another challenge on this project were the barrier walls, which were required to be over 8' tall in sections of the ramps. 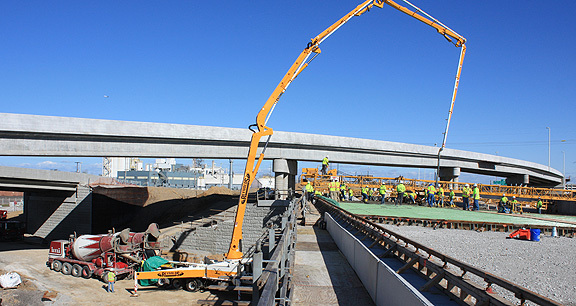 IMI supplied Walsh with 8,000 yards of a low-slump, paving concrete that was designed specifically to hold together in tall slip-form paving operations. IMI QC/QA used a special air entraining admixture to aid with air generation in the low slump concrete. In total, the footings, pillars, caps, bridge decks and barrier walls for the entry and exit ramps required 35,000 yards of concrete for this project. The entire Downtown Crossing project is scheduled to conclude by the end of 2016. For more information on air entrainment in concrete, early strength gain or preventing surface evaporation and cracking, contact the sales representative for the concrete plant nearest you. Click here.